Where Evel Knievel Never Soared: A Wallenda Flies Over the Grand CanyonNik Wallenda, scion of the famous Flying Wallendas family and known as “The King of the High Wire,” will traverse the majestic Grand Canyon on a tightrope tonight, without using a harness. And the Discovery Channel is airing the feat live (8 p.m./ET, check local listings), and has a dazzling, dizzying Skywire Live With Nik Wallenda feature on its website (to visit, click HERE). Wallenda will tightrope walk higher than he’s ever attempted before at 1,500 feet above the Little Colorado River, a height greater than the Empire State Building. In 2012, Wallenda became the first person to tightrope walk directly over Niagara Falls from the U.S. to Canada at a height of 200 feet. Wallenda, 34, said that this latest event will be the fulfillment of a lifelong dream to walk at such a great height as well as a chance to honor his great-grandfather, the legendary Karl Wallenda, who died after falling from a tightrope in Puerto Rico in 1978. The Grand Canyon, one of America’s most visited tourist destinations, provides a spectacular backdrop to the event. The tightrope crossing will take place in a remote section of the canyon operated by the Navajo Nation Parks and Recreation Department. By Eric BetzIn an international made-for-television event, Nik Wallenda will use a 2-inch cable to walk across the "Grand Canyon" here live on the Discovery Channel this Sunday. And although viewers in other countries might not be able to tell the difference, the location is highly significant to Helen Webster, manager of the tribal park. As part of the agreement with the Discovery Channel and NBC, which is producing the event, the Navajo Nation Parks and Recreation Department required that the two-hour television special include information about parks across the reservation and tribal culture. More than 13 million Americans watched live as Wallenda walked the same cable across Niagara Falls one year ago. Many others watched the event worldwide. It was touted as the largest audience for a non-sports broadcast in six years. Tribal officials hope to cash in on that audience when the majesty of their lands is broadcast around the world. 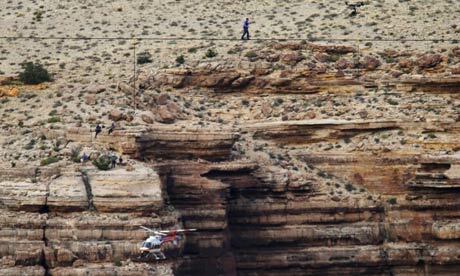 By Andrew BenderWallenda’s death-defying deed will take place today east of the park, across the gorge of Little Colorado River Navajo Tribal Park. It’s on land of the Navajo Nation, near Cameron, Arizona. That doesn’t make the stunt any less risky or the visuals any less spectacular. Wallenda’s two-inch (5 cm) cable spans 1,400 feet (426 m) across the gorge, 1,500 feet (457 m) above ground; that’s higher than the Empire State Building. Plus, the site is likely to be buffeted with winds up to 30 mph (48 kph). Although the tribal park is not in the actual Grand Canyon, they’re close neighbors. Some have called it a “little Grand Canyon,” and the Little Colorado River feeds into the Colorado River in the Grand Canyon. Permitting Wallenda’s walk was not a casual decision, says Geri Hongeva, spokesperson for Navajo Parks & Recreation. “Discovery Channel, NBC Peacock Productions and Nik Wallenda all had to complete a number of clearances and gain proper permits,” including archaeological, biological and environmental surveys, and handle tribal park land use fees and filming approvals. Extreme sports are permitted only rarely on tribal lands. High-wire artist Nik Wallenda walks across canyon, but maybe not GrandThe high-wire artist Nik Wallenda has completed a tightrope walk that took him a quarter of a mile over the Little Colorado River gorge near the Grand Canyon. Wallenda took just more than 22 minutes, pausing and kneeling twice and murmuring prayers to Jesus almost constantly along the way. He stepped slowly and steadily, but jogged and hopped the last few steps.But:Before the walk, a group of Navajos, Hopis and other Native Americans stood along a nearby highway with signs protesting against the event. By Levi RickertThe Navajo Nation received some exposure on television last night as Nik Wallenda walked across the Little Colorado River last night. Navajo Nation President Ben Shelly and Vice President Rex Lee Jim were on hand to congratulate high wire artist Nik Wallenda after he successfully walked across the Little Colorado River Gorge on a two inch steel cable on Sunday evening near the Grand Canyon. Wallenda's tightrope walk, which was near the Little Colorado River Navajo Tribal Park, was broadcasted live on the Discovery Channel to 217 countries throughout the world. "I want to congratulate Nik on his successful walk. I want to thank the Discovery Channel, NBC and all the workers who made this event successful. This is an example of what can happen when we work together. "I am pleased that the Navajo Nation was a part of this project and that we helped Nik achieve one of his lifelong goals. It was exciting to Nik walk on the tightrope with windy conditions and I am happy that he was successful. "The worldwide audience was able to see the Navajo Nation and now we invite you to come Navajo land. Come see the pristine landscape for yourself, with your own eyes, you won't regret it. "We invite travelers near and far to come experience Navajo land," President Shelly said. President Shelly, Navajo First Lady Martha Shelly and Vice President Jim sat together near the edge of the Little Colorado Gorge and watched Wallenda walk across the gorge. President Shelly gave a bolo tie to Wallenda after the walk and Vice President Jim presented Wallenda a silver and turquoise belt buckle. Vice President Jim said Wallenda's success is about achievement. "I want our Navajo children to know that they can dream big and have big success. Just like Nik dreamed about walking over the Grand Canyon, our young children can dream big about their goals in life and they can achieve them. "We can use each success and build upon that. Each success builds for bigger dreams and larger successes. "We can accomplish that for the Navajo Nation. "Comment: For more on the subject, see Tightrope Walk Over Grand Canyon Planned. Below: "Natalie Morales, NBC News; High Wire Artist Nik Wallenda; Navajo President Ben Shelly and Vice President Rex Lee Jim."